Have you ever felt like those beautiful, rich colors you witnessed didn't materialize on your camera? Well, they probably didn’t! Why you ask? It has a lot to do with the sunlight. During a beautiful morning walk, you have undoubtedly noticed how rich the colors are...the blue of the sky, the green of the leaves, the red of the cardinal. That same walk in the afternoon, when the sun is high in the sky, would yield flat and desaturated colors due to the of the amount of direct sunlight on the same subjects. Have you admired a river or stream that showed off its beautiful bedrock only to be disappointed with the picture? When light reflects off of non-metallic surfaces, such as water or leaves, it becomes polarized. It's this polarization that can ruin what you see. A polarizing filter is a piece of polarized glass that is typically screwed onto the front of your camera's lens that absorbs much of the polarized light before it hits your camera's sensor. The filter can be rotated 360º to optimize its effectiveness. It's You simply turn it while looking through your camera's viewfinder and stop when you see your desired effect. It is rotatable because its effect is impacted by the angle of the sun relative to your camera. 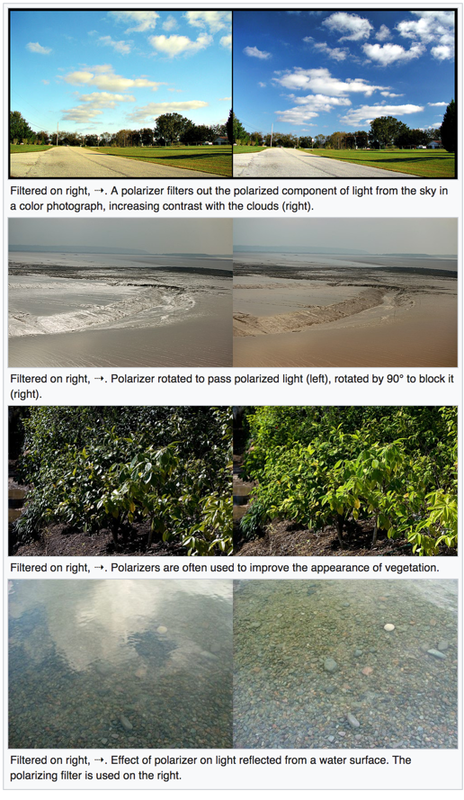 Look at the images to the right to compare polarized and non-polarized images. Big difference, right! Like many things, you can spend as much or little as you want. The price varies based on the size of your camera's lens but expect to spend between $50-$90 for a good one that will last you a lifetime. The cheaper ones tend to reduce overall image quality and scratch more easily. I've had good luck with Breatkthrough Photography filters. Other good brands include B+W, Tiffen, and Hoya. An Amazon affiliate link is below if you are interested in purchasing a polarizer. Thanks for reading. If you enjoyed this please take a moment to like this article and share it with your friends. Out to Sea was my most popular photograph of 2017. This image was taken last summer in Sea Isle, New Jersey. Sea Isle is a short distance away from Stone Harbor and Avalon, where we typically vacation each summer. Despite its proximity, I had never been there but and wanted to explore a new area. In preparation for the early morning outing, I used The Photographers Ephemeris (TPE) app (available for iOS or Android) to scout out potential photographic opportunities. TPE does a lot of things but I primarily use it to track the path of the sunrise and sunset relative to my shooting position. In addition, I use the maps view to look at the terrain. In this case, the maps view was my primary tool because I was looking for interesting features along the shoreline. Note: You could easily do this on Google Maps or Apple Maps using satellite view. After I had pinpointed a couple of points of interest, I got my gear ready and set the alarm for 4:30 am. Why so early? The best light for landscape photography is most often just before and just after sunrise or sunset. During this 'golden hour,' colors are rich and vibrant and the light is soft - ideal conditions for photography. BZZZ, BZZZ, BZZZ - I tiptoe around the family and quickly get dressed without waking them. I grab my gear and head to WaWa for a mega-large coffee - coffee is my friend ;-). The drive was less than 10 minutes. In short order, I’m barefoot on the beach and searching for those points of interest and just enjoying the solitude of the early morning. Life is good! There were too many clouds for a rich and vibrant sunrise but what I did get was soft and muted colors which suit my style anyway. The composition I had in mind was simple...I wanted a straightaway shot with the jetty starting at the front of the frame and extending to the horizon. My vision was to create an ethereal image by making the water creamy and getting some movement in the clouds. Also, I had black and white in mind since the morning colors were obscured by the cloud layer. I put my camera on the tripod and found my composition. Next, I added a 3-stop ND and polarizing filter. I then dialed-in the settings using Aperture Priority mode which I set at f11. I also manually set my ISO to 64. These settings resulted in a 60-second shutter speed (exposure time). When shooting moving objects, such as water, longer shutter speeds smooth out the water making it like creamy. I LOVE LONG EXPOSURE PHOTOGRAPHY BECAUSE IT'S LIKE CAPTURING A VIDEO IN A SINGLE MOMENT IN TIME. A shorter shutter speed, such as 1/25 of a second, would have shown the texture of the water and the surf. Either approach is fine. It comes down to artistic choice. After getting the shot I wanted, I wandered the beach a bit and took two other images but then headed back to join my family for breakfast. Later that week I found some time to edit the image. I use Adobe Lightroom and Photoshop for editing and cataloging all of my photographs. I enjoy this part of the process...it is probably the tech nerd in me but there is something cathartic about. Sometimes I make a lot of changes sometimes very few...again, it comes down to artistic choice and what the photographer had in mind when taking the image. In this case, there were not a lot of changes but a few big ones. My normal tweaks: Some black and white level adjustments to get the exposure just right. I converted it to black and white and adjusted some of the tonal values to my liking. Added some blue-greens into the shadows of the water. While this may seem like a 15-minute process, the final image was the result of several different edits and changes over multiple days. I have found it is helpful to step away from an edit and come back the next day to see if it still looks good. Sometimes it does...sometimes it doesn't...it just takes time to get it to feel right. The result is clean, simple, minimalist image. It's something that would not be seen by the naked eye. Tens of thousands of people walk by this jetty every year but they've never seen it this way. It’s 60 seconds worth of time captured in a single moment. Use the comments section, below if you have any questions. I'm always happy to help. If you are interested in hanging Out To Sea on your wall, please CONTACT ME and we can discuss printing and sizing options. 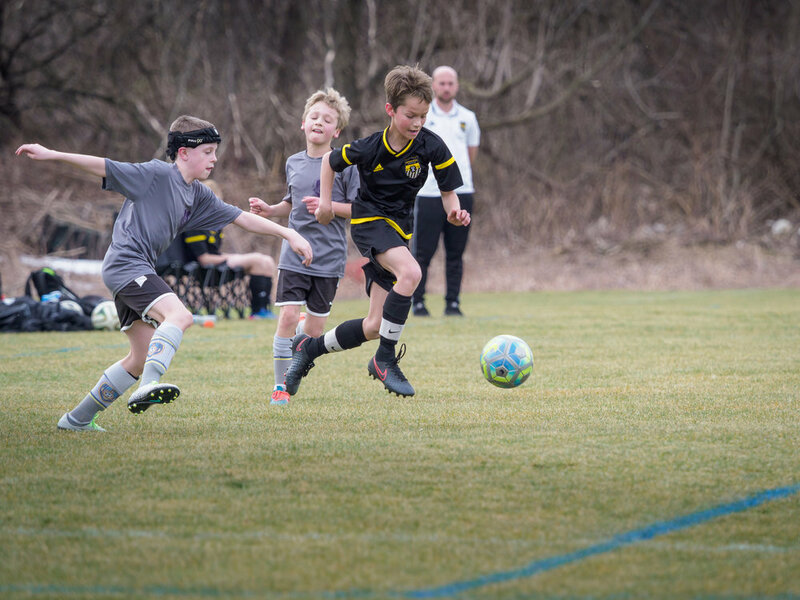 In my previous posts, 6 TIPS FOR SHOOTING KIDS SPORTS and THE SIMPLEST PHOTOGRAPHY RULE TO IMPROVE YOUR IMAGES, I mention ‘cropping’ a number of times. Cropping is a process by which you adjust a photo’s orientation, aspect ratio, and/or area of focus by cutting out unwanted parts of the photograph. Cropping is a common tool available on apps and in photo editing programs such as Apple’s Photos, Instagram, Adobe Lightroom, Snapseed, and VSCO. The crop tool works similarly across applications and easy to learn and use. 1. Zoom in to make your subject more prominent. As you can see below, the cropped image now emphasizes the subject and shows off the background while cutting out the foreground which, doesn't add any value to the image's story. This results in an image that is much more appealing to the eye. Here, I've cut out the ski lift wires and poles that are ugly and detract from the image. It's a small change, but because the aspect ratio of the camera is different than the size needed for an 8x10 (Original image was 3x4) print and frame, I need to crop the image a bit. As a bonus, I also got rid of the distracting light at the bottom right and was able to zoom in more on the subjects. I must admit, having a crooked horizon line is a pet-peeve of mine. An image just looks unbalanced to the eye when the horizon line is off. 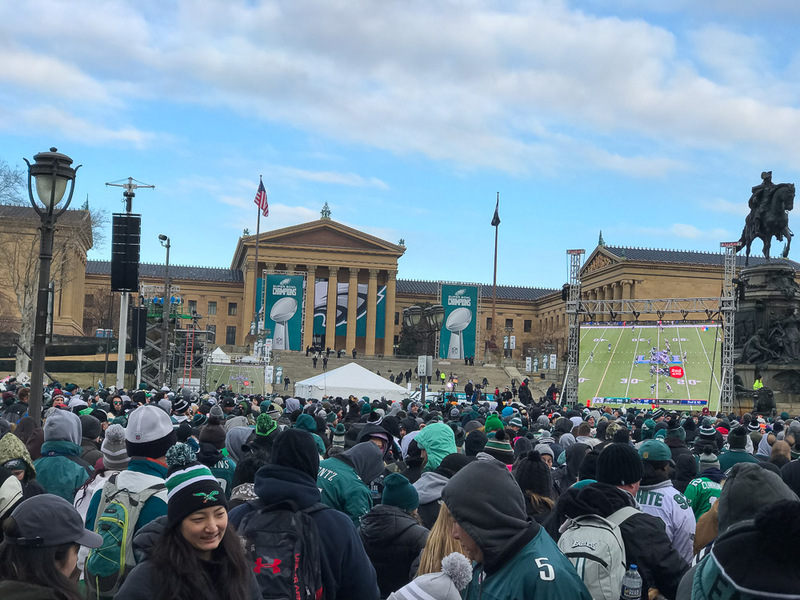 Getting the horizon line straight isn't easy when you're in the moment and getting a quick shot like the one below of the Philadelphia Eagles Super Bowl parade. It is easy to quickly fix the horizon line using your photo editing application and slightly rotating the image. As you can see in these examples, cropping can enhance an image quite a bit. You should be aware that when you crop you will reduce the overall image resolution. Therefore, you limit your ability to print larger. The resulting size limitations will depend on how much you crop and the original resolution of the image. For sharing online, you can crop your image a lot while not impact the overall quality. Take a look at some of your photos and give cropping a try. You'll be amazed at how much it can change the feel of your images. Comments, questions, suggested topics, are always welcomed. Use the comment and like buttons, below. Photography can be complex but there are a handful of simple things you can do for immediate improvement. The ‘rule’ I’ll touch on, today is The Rule of Thirds. The concept is simple: Slice your composition into vertical and horizontal thirds and place your subject on one of the intersecting points. Often, the resulting photograph is more pleasing to the eye as it helps the viewer move easily through the image. I have presented some examples, below. 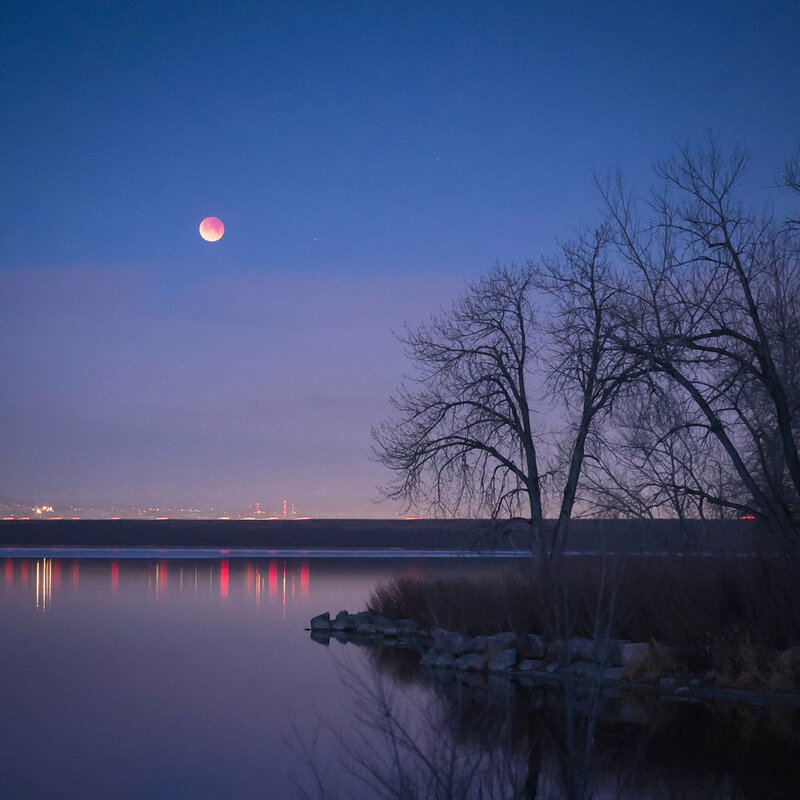 Above: I took this image, last Wednesday, of the Super Blue Blood Moon as it was setting over Denver, CO. To the right, I've sliced the image into thirds to better illustrate how the rule of thirds can be applied. You'll notice the main subject - the moon - sits at the upper, left intersection. Equally as important, you'll see the horizon line of the lake aligned with the bottom horizontal axis. I cropped this image to a 1:1, or square aspect ratio because I felt it was a more pleasing composition, largely because of the rule of thirds. 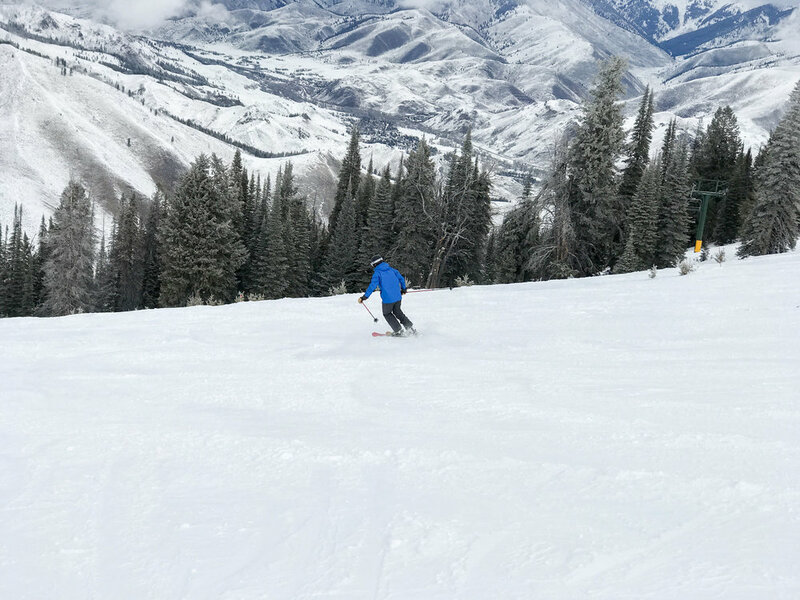 Below: To the left is the original image a friend of mine took of me skiing last week, in Sun Valley, ID, using his iPhone. This is probably pretty typical vacation picture where subjects are often centered in the frame. It makes for a fine memory but not a great picture. To the right, you'll see a cropped image where I placed the subject (me) at the bottom right intersection, resulting in a far better image. Keep in mind, the rule of thirds is really just a guideline and not a hard and fast rule. As an example, if your image lends itself to symmetry then centering the main subject can make sense as demonstrated, below. Even though my main subject is centered, note how the rule of thirds plays into the foreground of the image and the horizon line. Composition and good light are the two most important elements in photography. Your gear can matter but most of the time it does not. Give the rule of thirds a go and see how much it can improve your photos. BONUS TIP: You can enable the rule of thirds grid on your iPhone screen when you take pictures. Simply go to Settings > Camera > Grid. It is a great little reminder to help you compose your pictures better. Not too many people know about this little trick but it can have an incredible impact on the outcome of your image. It’s technically called 'exposure compensation.' Exposure compensation allows you to increase or decrease the overall exposure of the image before taking the photo. It gives you manual control over the exposure instead of relying on the camera to figure it out for you. Exposure compensation is a common feature on many DSLR and mirrorless cameras but was introduced on the iPhone back in 2014 with the iOS 8 update. Here are some real world examples you will be able to relate to: Have you ever taken a picture at the beach and the person you took the picture of is completely in shadow while the sky looks great? Exposure compensation can fix that. Have you ever taken a picture of that killer sunset but it doesn’t look as dramatic as what you saw with your own eyes? Exposure compensation can fix that, as well. The results can be dramatic. See the two images, below. To see the feature in action watch the video, below. Using this feature is super simple. Tap the screen where your subject is located and you’ll see the focus square appear. To the right of the focus square is a slider with a ‘sun’ icon. To brighten your subject, simply slide it up to your taste. To reduce the exposure, simply slide it down. Brightening the scene will expose more detail in your subject and often results in an improved photograph. Conversely, reducing the exposure can accentuate the colors of a sunset. Using this simple iPhone tip can make your photographs much better by properly exposing your subject. www.johnguillaume.com for gallery, blog, and Instagram. Let me know what you think in the comments, below. These days, nearly anything you want to learn is accessible on YouTube. As the content and production quality have improved, so has its popularity. Did you know YouTube is the second most used search engine, behind Google...it’s that popular! I bring up YouTube because it is, more-or-less, how I advanced my own photography. These resources have been an ongoing source of information and inspiration for me. I hope these can help you kindle your fire for photography, as well. As always, leave a comment or shoot me an email if you want to share any of your photos or have questions or comments. Get out of Auto! If you have a camera with manual controls, like most DSLRs have, put it on ‘Shutter Priority.’ For Canon users it’s the Tv on your mode dial and S on Nikon as well as many other manufacturers. (see image below) This setting allows you to control the shutter speed (how fast the camera’s shutter opens and closes). The higher the value the faster it opens and closes and the better chance you have of ‘freezing’ that moment. As the action speeds up, a faster shutter speed is required. A good starting point is 1/800th of a second. Take a couple of shots and see how they look. If you are getting unwanted motion blur, take it up to 900 or 1000 or even up to 1/1200. 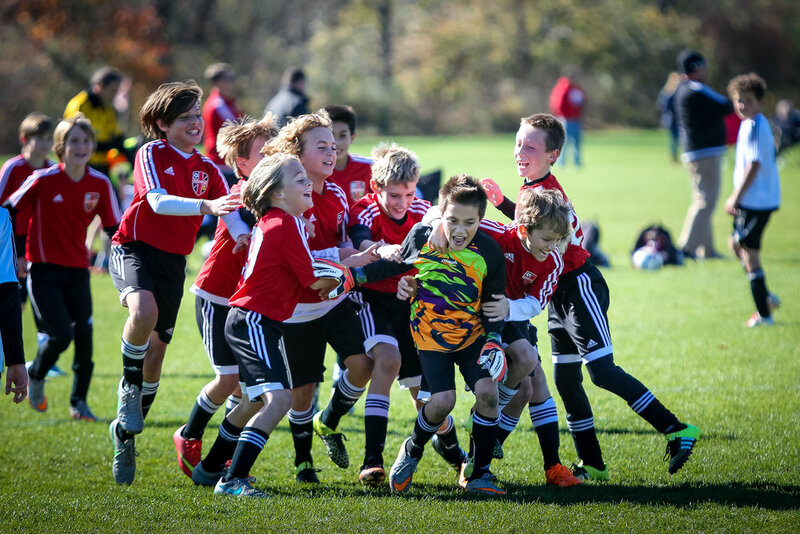 Younger players will be slower and you’ll be able to get away with slower speeds. Middle school and high schoolers definitely gets faster. Use a specific focus point(s). Most DSLRs will let you choose one focus point, a pattern of points, or, all of them. If you can pick one focus point, or a small pattern of them and follow the player with those points you will get the best results. Using a single focus point is often referred to a ‘single point auto focus.’ Do a quick Google search to figure out how to set this up for your particular camera model. Letting the camera choose focus points will be frustratingly inaccurate when there is potential for several kids in the same frame. As you may have discovered... sometimes it works but most of the time it does not. It will take time and practice to get good at tracking your subject but once you get it , 65-80% of your shots will be in focus. Anticipate the Action. Knowing where the action is going is critical. Anticipating action will vastly increase your chances of getting that killer shot of your son or daughter. Here are some examples: 1) Follow the ball and anticipate when it will be received. Once it reaches your son's feet, press the shutter button. 2) If your daughter is open and has her lacrosse stick is up to receive a pass, point the camera towards her in anticipation of her receiving the ball. 3) Once the basketball is in the air, anticipate your son going up for the rebound by pre-focusing below the basket...when he's in the air about to grab the ball, fire away. To do this, it certainly helps to understand how the sport is played but that will come with time. Crop the Image. 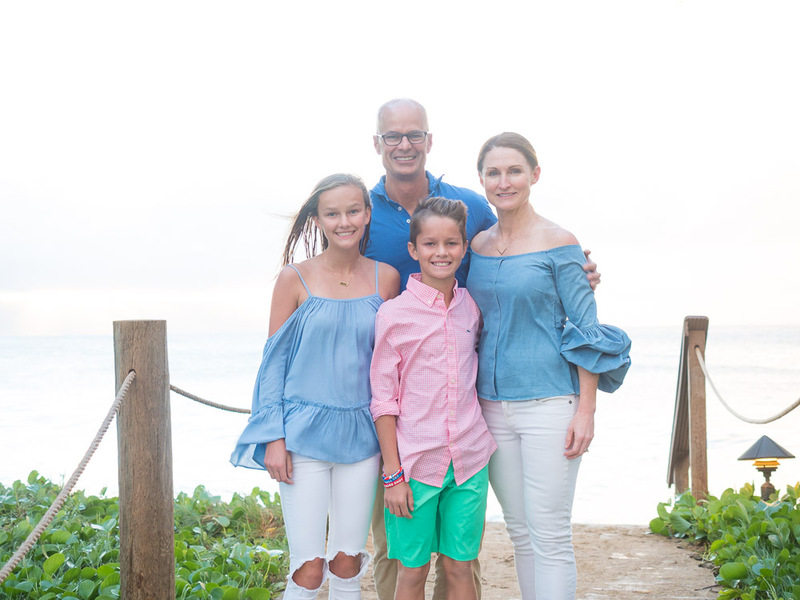 Once you get your images off of your camera and on to your computer or phone, simply ‘crop’ (digital zoom) them in any photo editing tool so that you better fill the frame with your son or daughter. Close-up action shots are almost always better (see comparison below) so don’t be afraid to crop an image in order to look them like you had a long lens. Some will argue that you lose resolution when you crop...this is true and unavoidable. However, for sharing these memories on Facebook or Instagram or even a 5.x7 or 8x10 print you do not need the highest resolution image. Keep in mind, if you want to blow an image up to a 20"x30" or poster size you will need that extra resolution. TIP: I do recommend a 200mm telephoto lens and ideally up to 300mm or 400mm. Get what you can afford and what you need...remember you’re not making a living doing this. However, you can still get great images with less expensive gear. 5. Be cognizant of your background. If there is a porta-potty or an overflowing trash can behind your daughter, it can ruin the image. Simply make sure where you are standing relative to your target subject that you can avoid those distractions. It can often be as simple as moving 10-20 feet either direction. Or, go to one end of the field or the other for a different perspective and background. 6. Go to where the action is. If your son or daughter is playing the Attack position in lacrosse, they will be on one end of the field...go down there to get closer to their action. Most refs will let you go behind the goal so don't be shy. Taking images strictly from the sideline can be limiting and the images will start to look the same over time. I should note that indoor sports are much more difficult to shoot because they typically have poor lighting. Basketball gyms or pools are notorious for poor lighting. Because light is essential for taking photographs, the less you have, the more challenging it can be. For that discussion we need to introduce the concepts of ISO and Aperture values. More on that in a future post. TIP: Don't be afraid to take plenty of images.. Most of them will be throw away but all you need is one or two keepers. Like all things, this takes practice and you'll only get better over time.